Yup that’s him, before his first game (their hats had not come in yet so that one is mine). 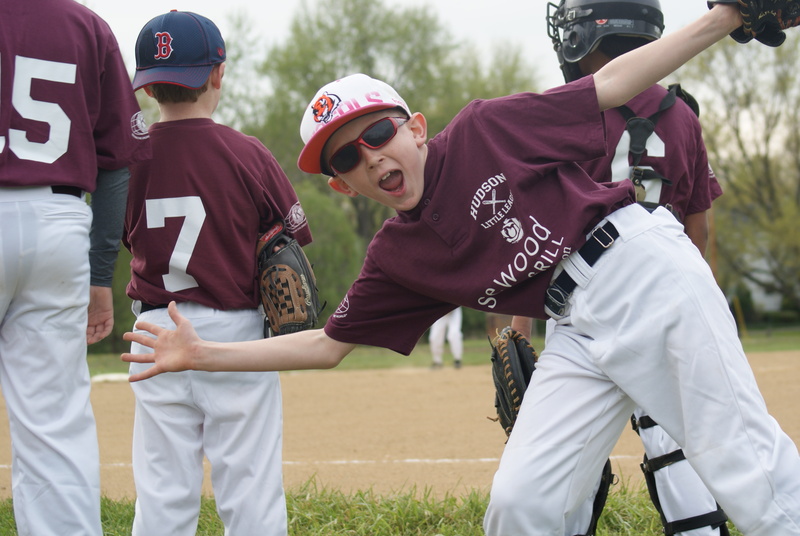 It’s his first year in Little League (back in St. Louis we didn’t have Little League we had Athletic Associations). He’s playing up a level so he’s pretty much one of the youngest in the league and his team, which is currently in first place. 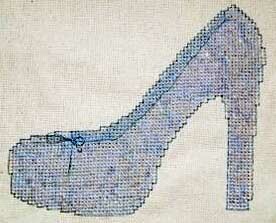 Beyond that, I finished a new shoe cross stitch picture (previously mentioned) and designed a few new patterns. One is a my take a red ruby slipper/shoe to finish my set of 4 shoes, done with DMC light effects. When I start on it I will get a post up with progress reports. Sabrina is still on the back burner. I just can’t take the beading that needs to be done at the moment and the break makes me feel like I accomplished something. So instead I have started a Christmas themed Starry Night pattern that I found in one of grandmother’s old books from the late 80’s. it is a church covered in snow, on black aida, with the words starry night above it. 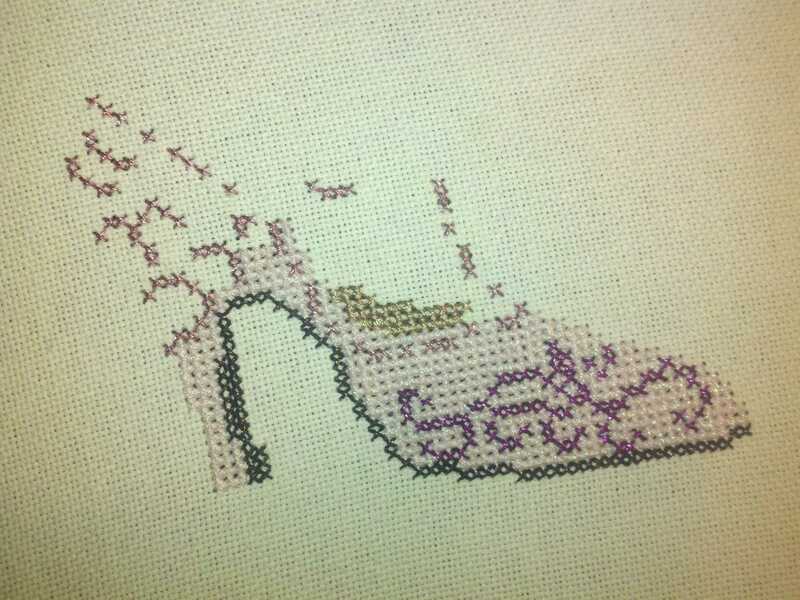 I am going to do the words in metallic thread and if I can figure out how to do those tiny fabric lights I will add them as well. Otherwise, I may just throw up some blue and white beads to create stars or snowflakes. To finish off my cross stitch accomplishments as of late, I am working on finishing up 3 other patterns, 2 sets of flowers and a Morning Dove. Hopefully, tomorrow I will have my review of Zoe Archer’s Skies of Fire. I finally got to read this on the plane to Philadelphia for my conference. Of course, I did not get to finish Passion Wears Pearls (that I started on the trip over) because AirTran wanted to strand me in Atlanta at Midnight on my return trip home (with of course no place to stay, except I found out the next day that some old college friends now live in Atlanta – that’s how well I keep up with everyone LOL). As trying to find a hotel to sleep in Atlanta, at midnight, on Friday was not my idea of a good time, I talked AirTran into paying for a rental car and I drove home from Philadelphia, back to Cleveland, leaving Philly at almost 8:30pm, after having been up since at least 6 am that morning. Needless to say I am just now recovering from being up for 21 hours straight and another 7.5 drive late at night. Other then that, it has been gardening, backyard bird watching (we now have both red and yellow finches, cardinals, blue jays, brewers blackbirds, and chickadees, hoping for hummingbirds now that feeder is out), and a little bit of hiking and questing at Cuyahoga Valley. We made our own stamps on Sunday and hit the Beaver Marsh quest. Then it was off to see the Avengers, which all three kids (including the 36 year old one) loved. So yes, we’ve been busy! Ahh that pesky lady is not done yet, but still making progress. I have not been working on it as diligently as I should be, but I am getting there. 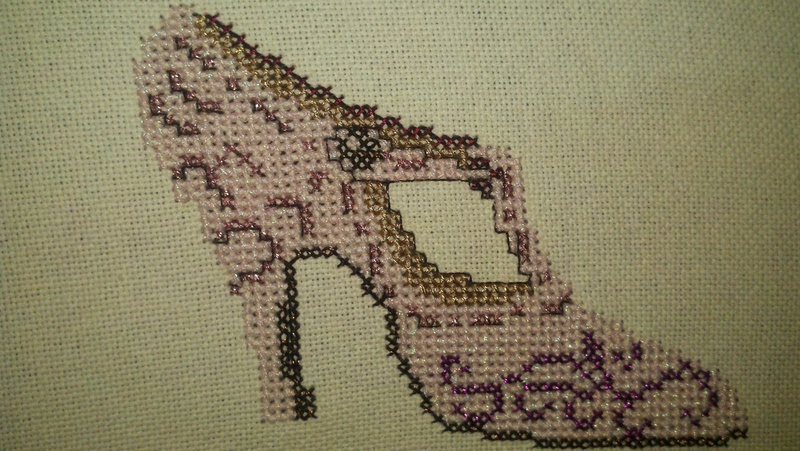 Not only do I have a lot of stitches left, but the beading on the picture is extensive and time consuming. I get asked a lot how I do such large projects. 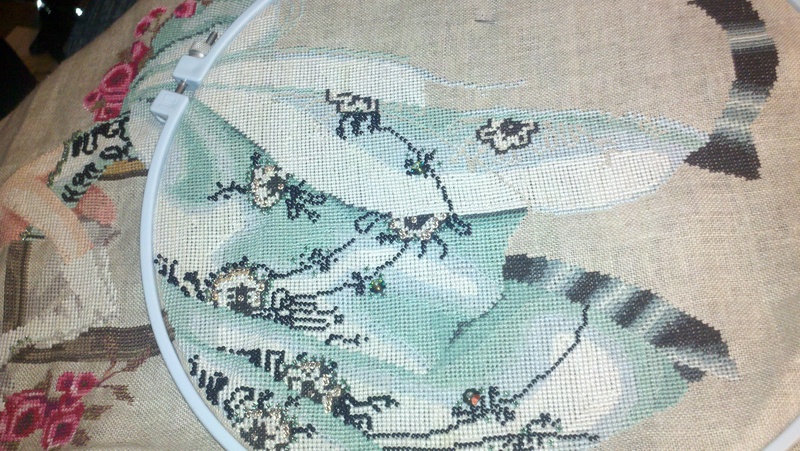 I don’t really count my stitches like others do, but instead prefer to stitch relative to the rows around it. So instead of counting out 10 stitches in the line, I see it as a puzzle. Thus I compare my start and end to the line above or below it, starting how many before/after, stopping how many before/after. I like this method because if I do make a mistake and miss it, I can easily correct the problem as I fill in the jigsaw. The other tracking method I started with this project was highlighting the pattern. I do find it saves me a lot of time as I no longer need to track where I am going and I can see the pattern fit together easily. Here is an example of the highlighting on this project. It also matches the progress I have made. 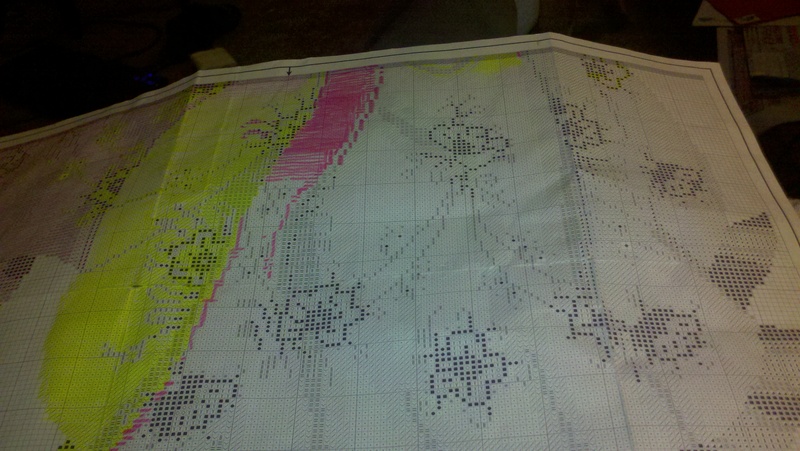 The entire opposite side of the pattern is already highlighted out. You can see there are some strings of un-highlighted areas. 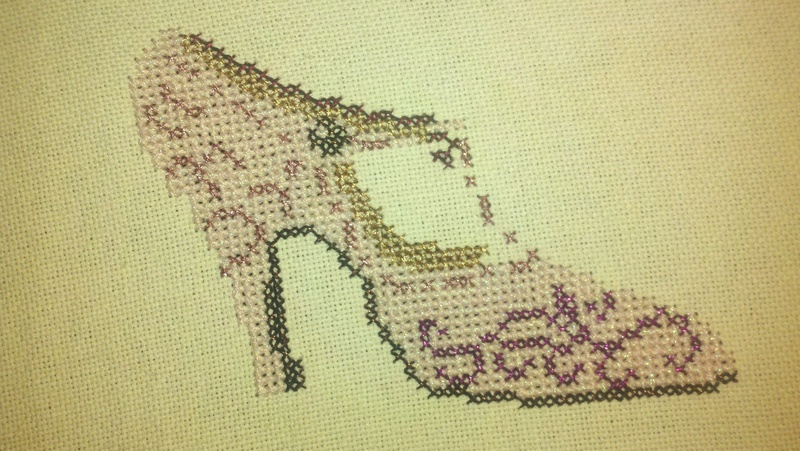 That is all the beading I still have to do. 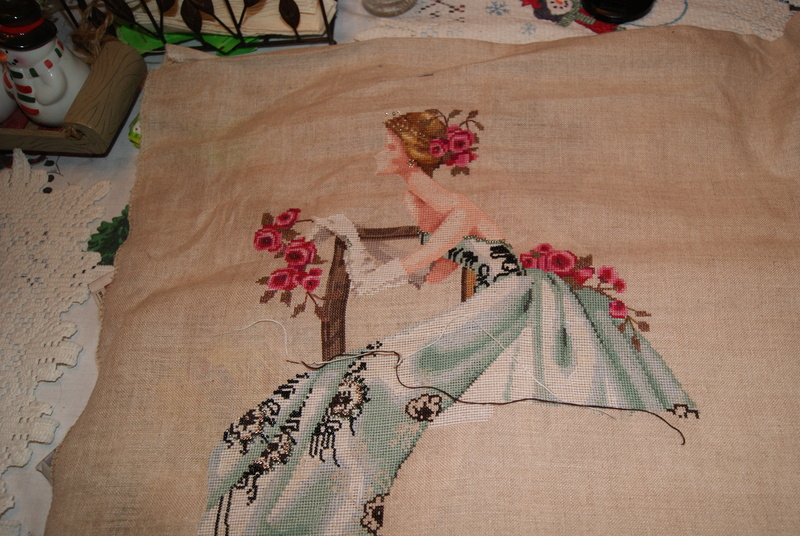 As you can see, I am about half way through her skirt, and then have to finish the beading. 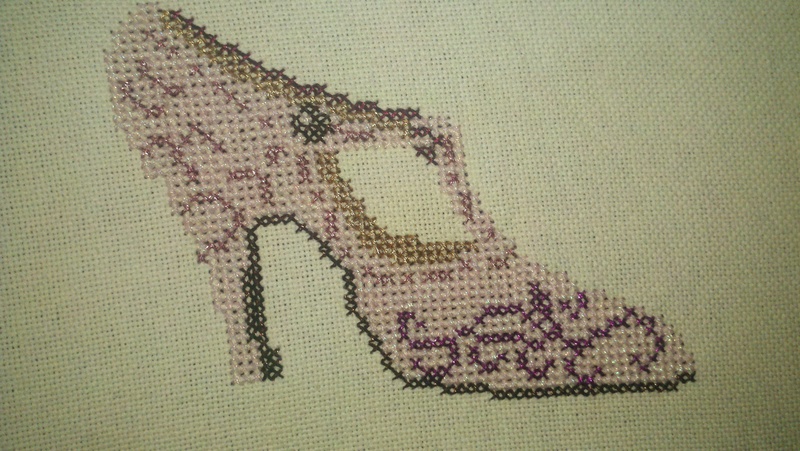 I have done almost all the beading on the front half. 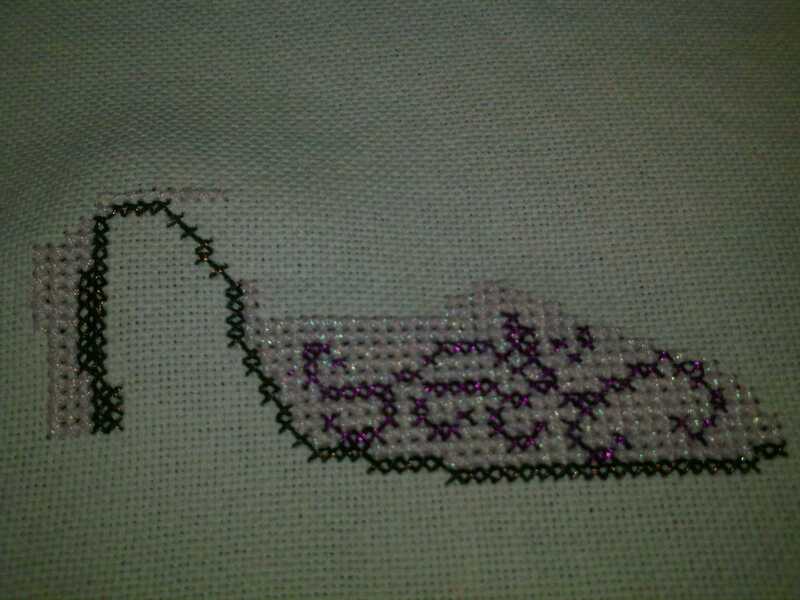 This project is also the first time I have used the very large beads. In order to secure them flat, I come up through the bead, put one of the green beads on top, turn in and thread back through. 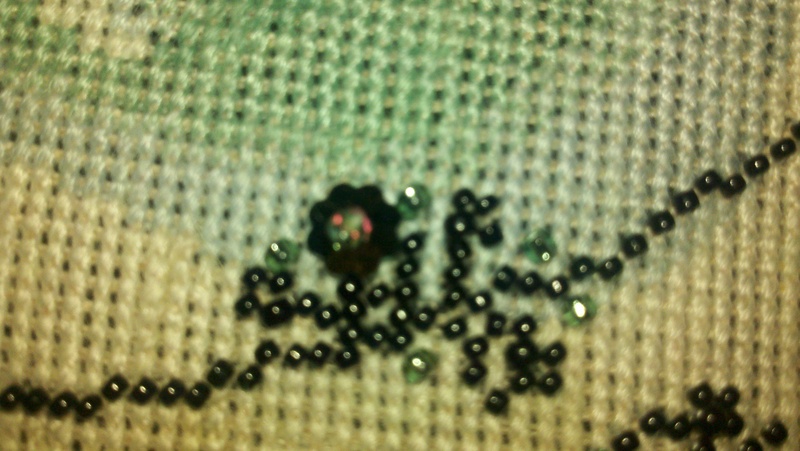 Sorry it’s so blurry, my camera on my phone dislikes real close ups, but you can see how I have the flower shaped bead laying flat with a bead on top of it. The rest of my beads are attached with single strand dmc in one of the colors surrounding the beads. I chose not to use black thread to secure the beads because it will show up against the light colored blues and whites of the skirt. I attach my beads with a half stitch. I do all my stitches going right for the under and left coming back. Thus all my beads are secured, half stitch to the right using a beading needle. You can also see that I have moved off my QSnap frame to a 10 inch hoop. 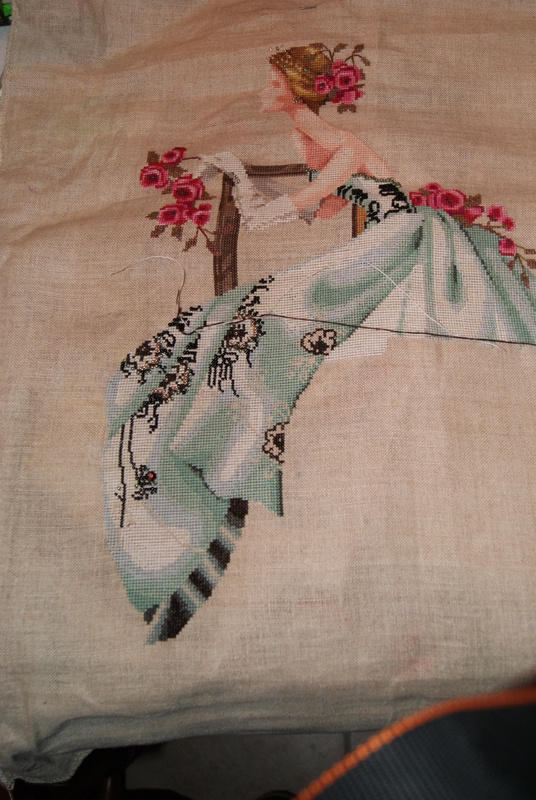 I use the qsnap on large projects when I am working more in the middle as a way of controlling the amount of fabric. 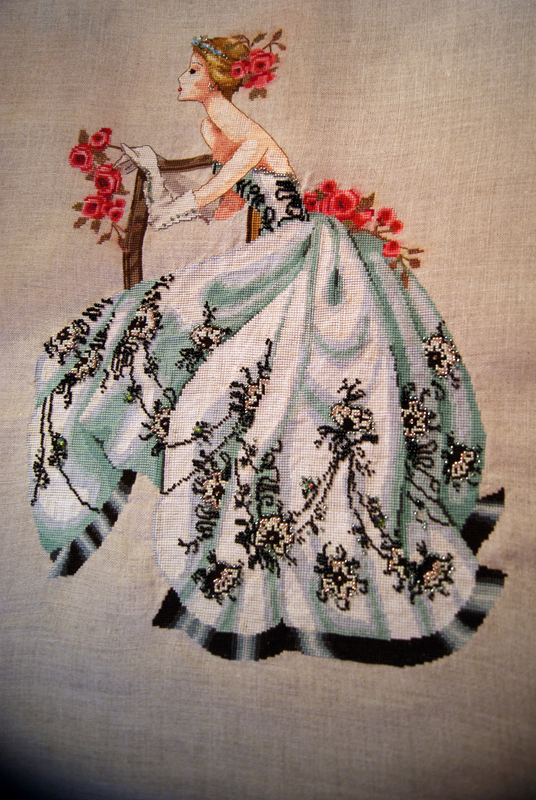 But now that I am down to the bottom, I move to the hoop as it is easier for me to hold and stitch with. 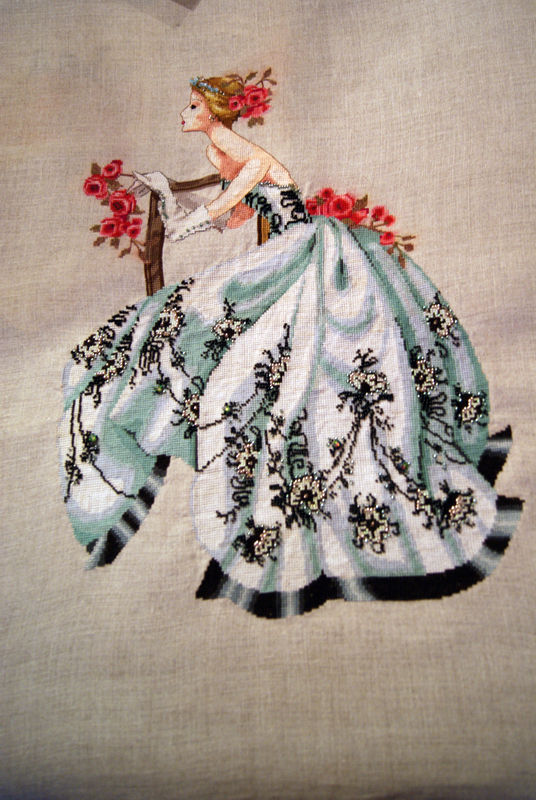 So if you stitch, how do you prefer to stitch and how do you handle doing specialty stitches and beading?